No matter how it’s installed, half-inch (~12mm) mesh will not prevent shrews from getting into a hive. Shrews, or more accurately, the pygmy shrew, can even slip through standard 3/8-inch metal mouse guards. That’s why I use quarter-inch (6mm) mesh to keep both shrews and mice out of hives. I know beekeepers in Newfoundland who only use half-inch mesh to keep mice out of their hives and have done so for years. I took most of my cues from them when I first started beekeeping. None of them ever told me about shrews. I wish they had. I didn’t have a problem with shrews when I kept my bees near downtown St. John’s. But shrews destroyed most of my colonies once I got out of the city. I didn’t know what was happening with my bees until it was too late. Shrews target the thorax by removing the head or entering through the top making a large hole hollowing out the thorax. They may also consume some of the exoskeleton leaving what looks like dirt (wings, legs and bit of the abdomen). With shrews weighing about 3 grams and requiring 125% of their body weight in food per day, they may consume over 450 grams of bees in 120 days of winter. Here’s the math on that one: An average honey bees weights 1/10th of a gram, so every gram of bees is 10 bees. A shrew that eats 450 grams of bees over the winter has eaten on average 4,500 bees. And that’s only if ONE shrew is eating away at the bees. Even if all the bees aren’t destroyed, judging from what I’ve seen in my hives, the cluster shrinks and the bees becomes so stressed that they die. Shrews are the worst. Neither mice nor shrews can get through quarter-inch (6mm) mesh. 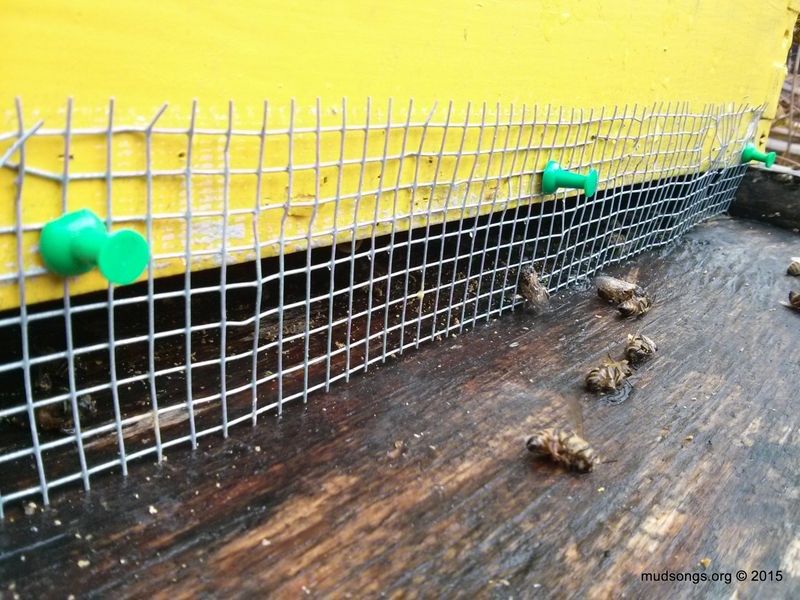 I staple or use push pins to attach the mesh over my bottom entrances usually by the first week of October, or whenever I think it’s getting so cold that the bees are beginning to cluster. I could probably wait until December, but having lost 6 out of 8 colonies once, I just can’t risk it. Even if the bees are still bringing in pollen and the mesh knocks some of the pollen off their legs, too bad. They’ll live. I even add the 6mm mesh to the top entrances once I know the bees are huddled down in their winter clusters for good. I probably don’t need to attach mesh up top, but again, I’m extremely cautious. When I lost my hives to shrews, the hives were buried in snow most of the winter and the shrews were able to get into the hives through the top entrances. So it may be safe to keep the top entrances open, but if the level of snow is anywhere close to the top entrances, the mesh goes on. I keep the mesh on until the bees start bringing in pollen again, which for me is usually some time in April or May. But if there’s still snow on the ground or crazy Newfoundland freezing rain and snow is happening, the mesh stays on. If the bees are cold and clustering, and therefore unable to defend themselves against mice or shrews, the mesh stays on. This entry was posted in Diseases & Pests, Mesh, Mice, Month of October, Shrews. Bookmark the permalink. I heard a rule of thumb that if you can get a ballpoint pen (about 6-7mm, or a quarter-inch) into a crack under a door, a mouse can get through there. The rule of thumb isn’t more specific than that though – whether they can squeeze through a hole that’s a quarter-inch in diameter. Come to that, it’s not even clear what type of mouse is meant by the rule. I may have caused more problems than I solved. Anyway just thought I’d share! I’ve been asking around, and most people seem to think half an inch is too wide to keep the mice out. Cancel that. I just updated this post with more detailed info. The half-inch mesh should be fine. after seeing this I tried the mesh as well but unfortunely the bees didn’t like that I recycled the mesh from a rabbits cage. they got aggressive and hunted me down all day, even so much as hang out by the windows waiting for me to tell me off. the next day they were fine (once everything was taken away the night before) it happened once before when we tried feeding them at the enterance and the hornets made their life miserable. besides needing new mesh I think requeening in the spring with some more gentle girls are in order. has you bees every came and told you they didn’t like something? My bees have come after me a couple times. The last time was when I took a few frames of honey from the honey super without using the smoker to drive the bees down first. A day or two later, though, and they were fine. I used to stay away from the smoker if I could, but now I see it as a necessary tool whenever I do anything that could cause the bees to release lots of alarm pheromone and become extra defensive. When the bees associate the bad breath of humans with anything that causes alarm, humans can become a target. The smoke diminishes that target potential. The smoke confuses them but it also disrupts the honey and pollen collection for the day, throwing them off. That one day of distrubed production could be 1 – 2 lbs of honey lst every time you smoke them. When you consider the short summers and how half of these days may be rain so time for collecting honey is that much shorter. That is why I try to advoid teh smoker as much as possible. I may light it up but int most cases if they are not aggressivly dive bombing me I don;t smoke them. I also chew mint gum everytime I inspect to take the edge off my breath. Don’t know if it works but that is what I do. The key to using the smoker is to use it sparingly. Just a small puff or two here or there doesn’t hurt if done properly. When I first used the smoker, I practically drowned the bees in smoke. Then I stopped using it together. Then I found the middle ground by just watching how the bees reacted to the smoke. A couple small puffs on top of the frames don’t hurt to shoo away defensive bees. But once the smoke gets into the hive, either trapped under the inner cover or blown through the front entrance, the sound of the hive changes to a louder rumble. That’s when I know the bees aren’t happy. They may be easier to handle because they’re gorging on honey, but they’re not happy. I think using the smoker is one of those things, like many things in beekeeping, that takes practice. I keep forgetting about chewing mint flavoured gum. That’s a good one. I may switch to quarter-inch mesh for my mouse guards next year. It looks like tiny shrews can fit through the half-inch mesh. I had no problem with mice or shrews until I moved my hives to a new location two summers ago. One of my 8 colonies ran out of honey and died last week. This is what bees that have starved to death look like. The musk sent of the shrew (or a mouse) has a spooking effect on the bees and instead of stinging the shrew to death, the bees get stressed, the queen gets stressed and sometimes dies, and once she’s dead, the rest of the bees pretty much lose their minds, all their survival instincts disappear and before you know it, they’re doing strange things like pooping inside the hive and ignoring all the food that could keep them alive. It’s bad news. …and it worked fine until last winter when a shrew got into one of my hives and, again, the colony died. I thought I was simply too late installing the mesh last year, so I made sure to install it early this year. But now I’m beginning to think the shrews can squeeze through the half-inch mesh. I plan to switch to a quarter-inch mesh for next year or perhaps block off the bottom entrances and use only top entrances instead. All of my other colonies were huddled inside their hives on a cold day that I checked on them — except for this colony which was very active with bees flying around everywhere. I didn’t know what was going on but I knew it was strange. It’s possible that’s the day the shrew got inside the hive. I’m switching to quarter-inch mesh for now on. Half-inch keeps the mice out, but not the pygmy shrews. I lost two more colonies due to shrew predation. I’m adding smaller mesh to the remaining 5 hives as soon as possible. Even if it traps the shrews inside, I have to risk it. If this keeps up, I could lose all my colonies this winter. My brother-in-law has his hive on our land. No mesh on hive entrance and we learned the hard way how much mice like honey! 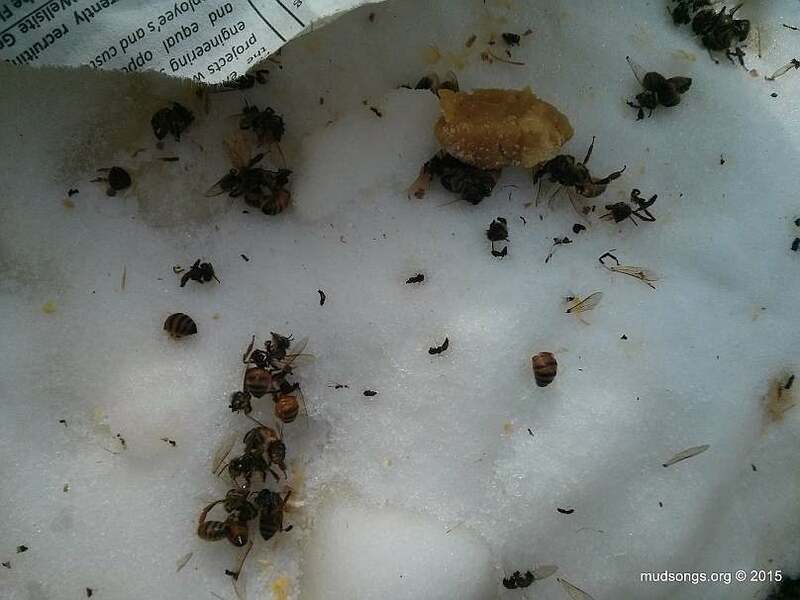 Went to check hive a couple days ago and found quite a number of dead bees outside in the snow. Decided we had a bad problem and lifted the top cover off to take a peek and could see mice inside. Grabbed a stick a began taking the hive apart. Killed around a dozen mice! They had completely consumed all the honey. No bees left at all and hive was completely filled with shredded leaves and other nesting materials! Will have to start from scratch in spring and will definitely be meshing the entrance to the hive. Thanks for the helpful information. I have noticed that one statement says that 1/4″ mesh will strip off pollen from the bees and 1/2″ mesh can allow smaller rodents like the pygmy shrew, inside the hive. Thinking 3/8″ may be the best choice.